On a warm summer evening, there are few things more enjoyable than a cold frozen treat to beat the heat. 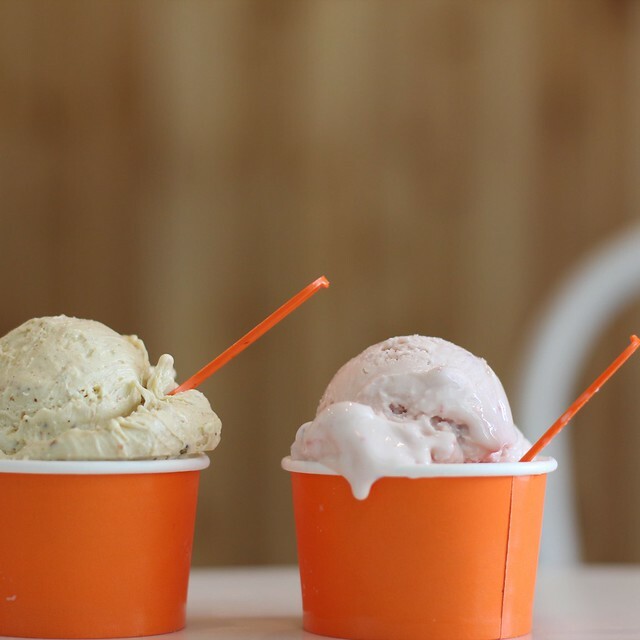 But with so many options for a scoop in Alexandria, where should you go? As a part of our neighborhood guide series, we'd like to help you find your way. Alexandria, Virginia is known for many things, not the least of which is its vast array of delectable restaurants. 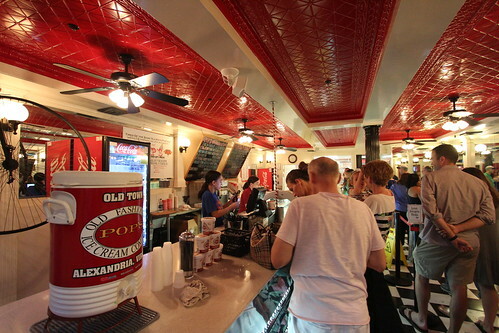 Beyond traditional eateries, Old Town's concentration of ice cream shops is plentiful enough to please anyone's palate. Some might even argue that we actually have too many options, but those people obviously have something against ice cream and are simply crazy. Within a short five minute walk from our home in the heart of Old Town we have no fewer than nine different ice cream establishments. 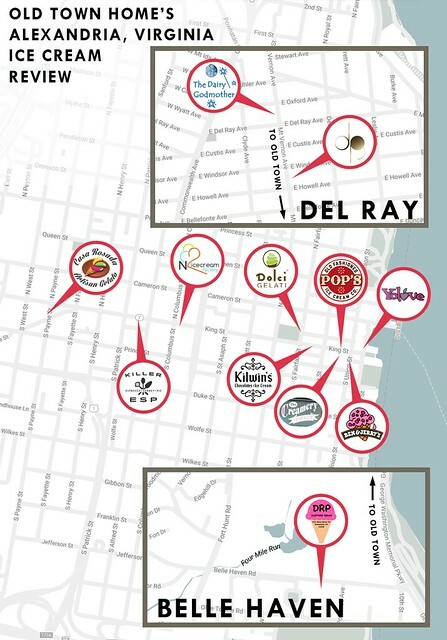 Add in the nearby neighborhoods of Del Ray and Belle Haven (all within about 1.5 miles), and we take that number to an astounding 12 different places within walking distance where we can grab an ice cold sweet treat! If you've ever talked to a local, everyone tends to have their favorite suggestion on where they like to go for a scoop or two. But the question of "which ice cream place is really the best?" is one that's not easily answered. 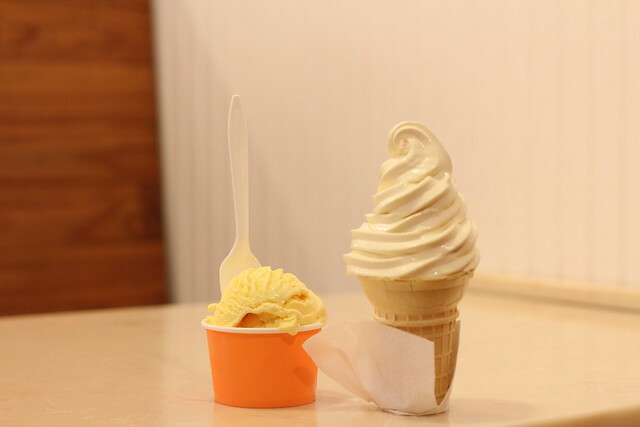 Now that we’re in the midst of summer, we felt it was high time we fulfilled the very difficult task of reviewing each of these 12 stores to share our first hand experiences and opinion on which ice cream store reigns supreme. We hatched this plan with our friend, Dan, a fellow Old Town resident who is known to regularly frequent many of these stores. Our goal was simple: try all 12 different ice cream stores and provide our opinion. In each case we had a clear objective: experience the store as if it were our first time, then judge our overall experience from service, to atmosphere, to the ice cream we selected. What follows is a recount of our lactose laden adventure around Alexandria. If you'd like, you can skip ahead to our top five rankings, use the menu below to jump to a specific review, or you can enjoy a review of each and every one of our twelve neighborhood ice cream locations below. Hey, we're nothing if not verbose! Pop's sits in the often packed lower King Street at 109, and is a favorite throwback among locals and tourists alike. The flavor list is extensive with three full cases of ice cream. Their nostalgic decor is reminiscent of an old fashioned ice cream parlor and the staff dresses the part to boot. They offer homemade scoops of ice cream along with options for sundaes and milkshakes. It's not uncommon for the line to snake out the door on a hot weekend evening, but it tends to move fast due to the interior setup that prefers standing room over seating areas. Most people tend to grab their ice cream and go, heading to the waterfront pier to enjoy their treat. Pop's is truly an institution in Old Town, and something people from all over often make a trip to enjoy. 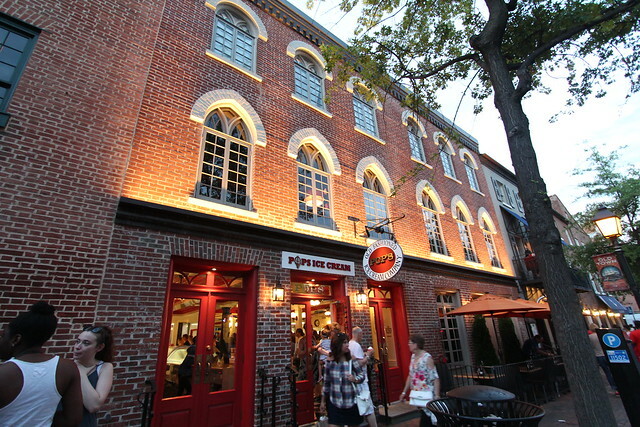 Alex: Just walking into Pop’s sets the stage that works so well on the historic streets of Old Town Alexandria. The staff at Pop’s is dressed in classic soda jerk style uniforms, and they are all extremely helpful and happy to offer free tastes. When it came our turn, I stared at case after case of the homemade ice cream that beckoned, and I went with what looked great in the moment, the “Big Papa.” It’s vanilla with big chocolate chip cookie dough and fudge chunks, and it’s delicious. Another really nice touch at Pop’s is the cooler of water at the end of the counter with small cups, which is welcome given the very sweet nature of their ice cream. Dan: This was a rare summer day in Old Town, NO line @ POP’S! We walked right in; granted we went at an odd time of day and most people are not eating ice cream as an appetizer to dinner on a Friday, late afternoon. Such a great display of homemade ice creams and so many original flavors. I wanted to go out of my normal ice cream flavor profile and had a small scoop of peanut butter, swirl of chocolate and pretzels. The peanut butter ice cream had nice peanut flavor but i really would have liked a bit more chocolate and pretzels; I will chalk that up to a small scoop and I was the first scoop of the batch. Pop’s is one of the most iconic ice cream stores in Old Town and there is a good reason why the lines are normally out the door. 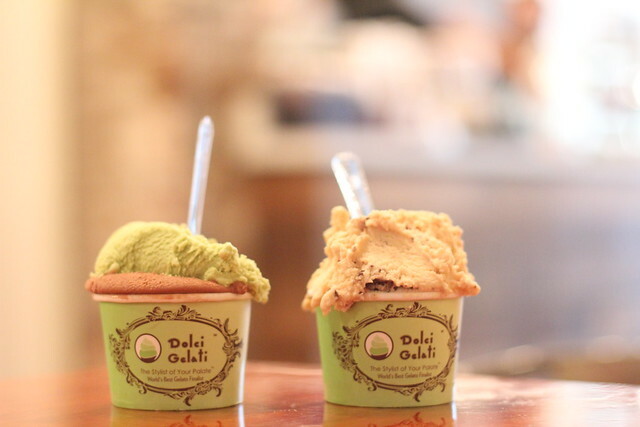 Dolci is a somewhat recent addition to Old Town’s ice cream scene. 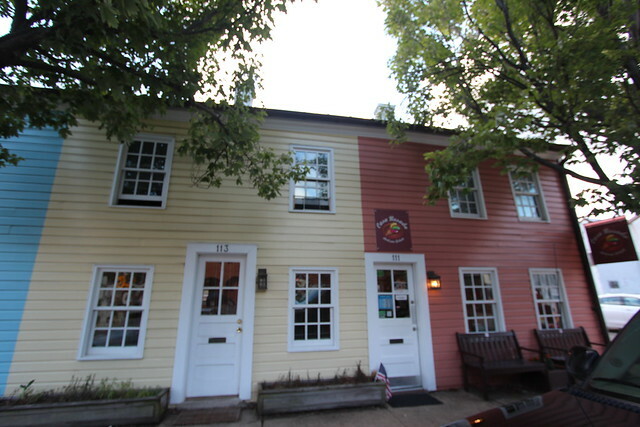 It’s located at 107 N. Fairfax Street, right across from Old Town’s Market Square. This spot makes it an ideal location to grab some ice cream and either head out to the fountain to enjoy, or sit inside and plan your time in Old Town. 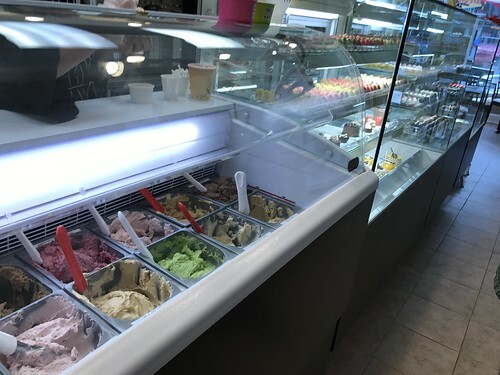 Dolci is a local DC business started in 2006 by a pastry chef, and specializes in their all natural Italian style gelato and sorbets. Their ingredients are sourced from local dairy farms and a sustainable farm in Ecuador. They’ve received rave reviews from area publications, and you can almost always find dozens of people enjoying their gelato around the Market Square fountain. 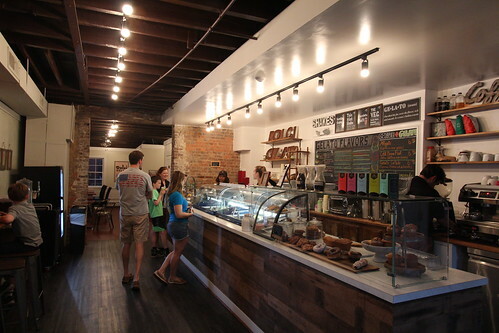 Alex: The staff at Dolci were extremely friendly and immediately offered taste tests of any flavors we wanted to try. After sampling the Nutella Banana, I ended up ordering a small with two flavors, Sea Salt Caramel and Peanut Butter Cup. The small is $5 and allows for one or two flavors. We chatted a little with the staff as they served up our heaping helpings. This “small” was much closer to a medium from the other shops, so they certainly don’t skimp on the scoops. The gelato itself was quite good. It was soft, smooth, and full of the intended flavors. We grabbed our cups and sat in the back portion of the store where there tends to be ample seating space. 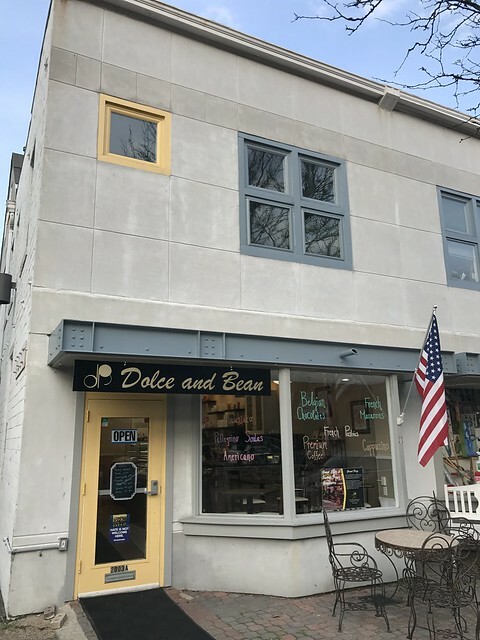 Dan: Dolci is on a busy corner in Old Town and we timed it well since we had four gelato clerks offering to help us... love that! It is gelato so I went for my go-to flavor of pistachio and added dark chocolate to match it. Chocolate covered pistachio equals heaven! I would have really liked a bolder pistachio flavor but the dark chocolate absolutely made up for the flavor and was delicious. They had about 20 different gelatos and a few sorbets; it is always a good ice cream day when you have the opportunity to mix and match so many different flavors! Del Ray's custard institution is located at 2310 Mt. Vernon Ave, or "The Avenue" as locals know it. People have been visiting this locally owned small business for years and raving about the selection of homemade custard and sorbet. Anyone who loves our area likely loves Dairy Godmother. Hey, they even have an "Obama sat here" chair from his visit while in office. The owner of Dairy Godmother, Liz Davis, toyed with the idea of closing shop for good last year, but thankfully reopened after a tremendous number of public pleas to do so. 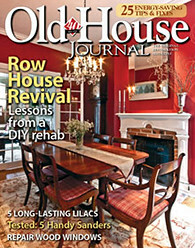 She was looking to sell the business, and that finally happened just a short time ago when the new owner, Russell Gravatt, took over the shop while Liz will stay on for the time being as a consultant and the visionary behind the the store. Liz will be retiring soon, so there's no time to waste if you want to try this shop in its original form (though it seems Russell plans to keep the classic nature just as it is). And if you have a pup that's a fan of ice cream, bring them along as Dairy Godmother offers up Puppy Pops, a favorite of Lulu's. Alex: Over the last year the question as to whether The Dairy Godmother would reopen has been on the top of many Alexandria residents’ minds. We’re so happy that we’re able to include this stop on the list, both for your benefit, and for the fact that the custard is awesome (and still available). 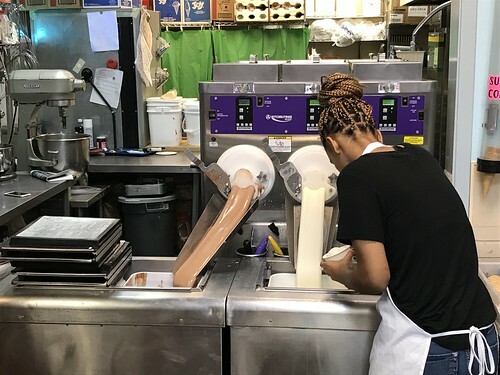 The price at Dairy Godmother is great, the staff is efficient and helpful, and the custard machines with their thick ribbon of creamy custard on display builds excitement. The Tollhouse Cookie was the flavor of our choice of the three that's available daily, and it was excellent. Though it’s a little bit of a longer walk from our house than some of the other places, it’s definitely one of our top five locations. 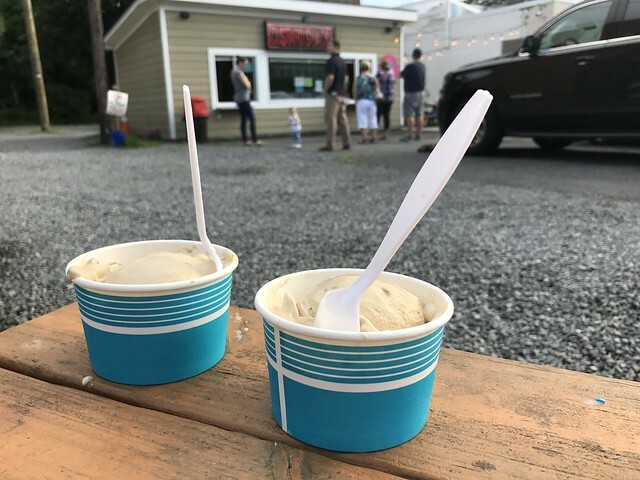 Dan: The Dairy Godmother is an institution and a "must have" ice cream in Del Ray. Alex and I went on a Thursday, early evening, and the place was jam packed! 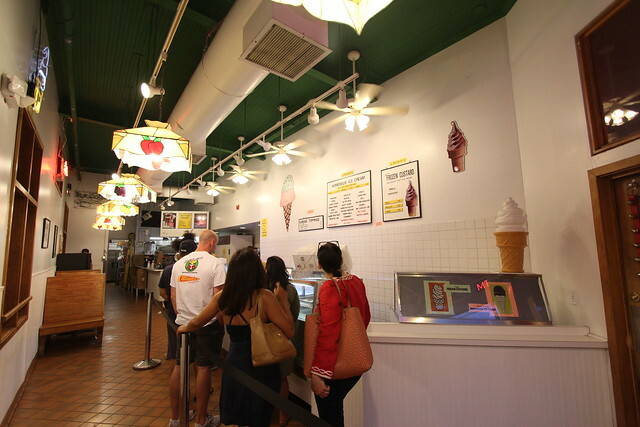 They only serve three flavors of custard per day (vanilla, chocolate and flavor of the day). The day we visited the flavor of the day was tollhouse cookie and I went for it! Small cup was only $3.25. I should have went with a double but more ice cream tasting was on the agenda. It was creamy, delicious and a nice amount of tollhouse cookie - a perfect custard! Stella (my dog) tells me that they also have some of the most fantastic doggie ice cream; she always asks for more! 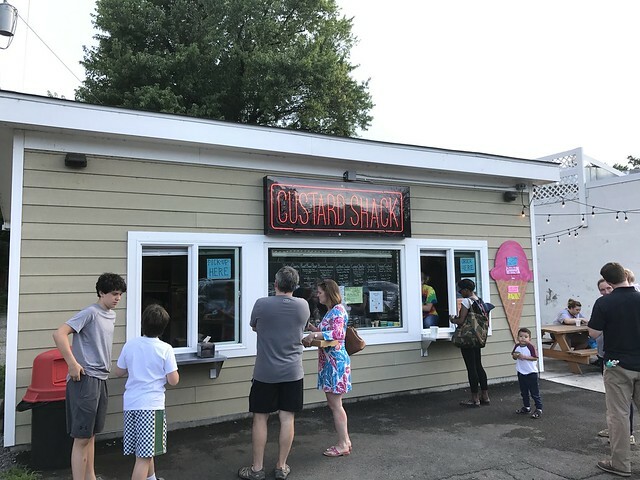 This small custard stand attached to the Belle Haven location of DRP (or Del Ray Pizzeria), truly packs a custard punch. Though it’s only open from April through October, that only improves the ambiance. The walk up window, packed parking lot, and nearby picnic tables for enjoying your custard or sorbet is classically nostalgic of a neighborhood ice cream stand of prior generations. The Custard Shack’s custard and sorbet flavors of the day change every few days, so it’s best to check their Facebook page or website for their flavor calendar. 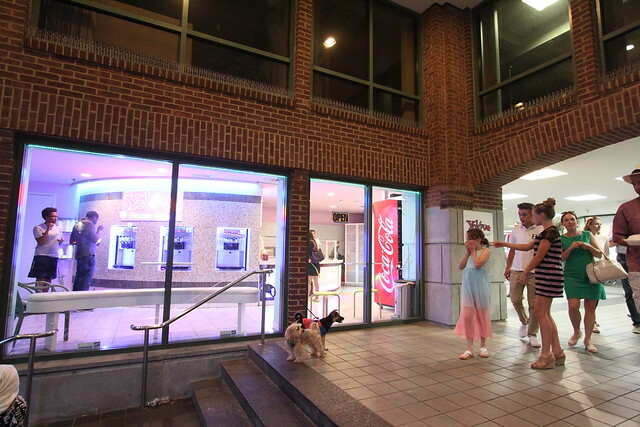 Beyond the custard and sorbet there are options for shakes, floats, Sundaes (with so many toppings), puppy pops for the four-legged fans, and even pints or quarts of their offerings to go. Though it’s a decent hike from the middle of Old Town, walking South on the Mount Vernon Trail puts you so close that it would probably be a shame if you didn’t take the slight detour for a cup, cone, or maybe even a root beer float. Alex: We went on a Sea Salt Caramel custard day and it was absolutely delicious. At just $3.45 for a small it’s one of the most reasonably priced options in the area, but the price has nothing to do with the size or flavor. My custard was delicious, and plenty for a single serving. Looking at their various flavors for the month, as well as the other options beyond a cup of custard, I’m excited to head back often, definitely next time with Lulu. 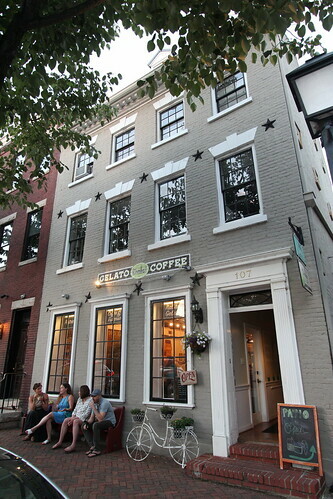 Situated less than a block from King Street within a row of colorful historic row houses, the artisanal gelato store at 111 S. Payne Street offers a taste of Argentinian-style gelato. When you visit Casa Rosada, or "Pink House" (it's the only pink house on the block), you'll typically find one of the store's owners behind the counter serving up your gelato. The flavor choices are limited to a handful each day, each advertised on boards on the back wall, are always changing, and tend to be extremely creative. The interior is small, as to be expected by their small historic building, but the ordering and serving/cashier area work well. This is the epitome of a small business in Alexandria that locals have come to love, and is a wonderful addition to our area. Alex: I love this shop for its ambiance, the family run nature, its historic location, and all of its unexpected flavors. I gave the Sambayon (Port & Masala) and Cinnamon a try in a small cup and really enjoyed both of them. Wendy tried the Sambayon and didn't much care for it, but did like the Cinnamon. This is why it's great when you're able to try samples of the ice cream or gelato, since not everything is everyone's favorite. 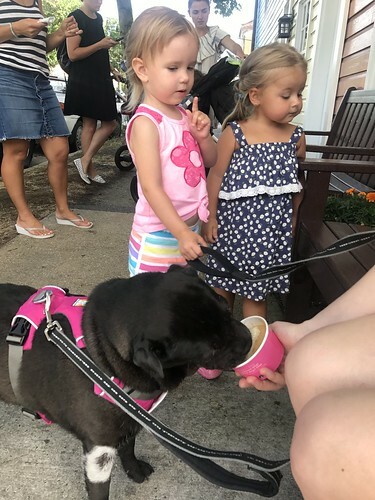 Speaking of favorites, Lulu got to try out their puppy ice cream offering, and she seemed to really enjoy it. From the presentation, with a little bone on the top, to the ice cream itself, Lulu really couldn't get enough. Dan: Casa Rosada is a small but wonderful gelateria. They had a nice selection of gelatos and sorbets. Today I went with two familiar flavors (cinnamon and pistachio). The cinnamon was creamy, full of cinnamon flavor but not overpowering that it negatively affected the other flavor. As I mentioned in other reviews, pistachio is my go-to gelato flavor and Casa Rosada did not disappoint. The gelato had tiny pieces of pistachio and an exceptional flavor. 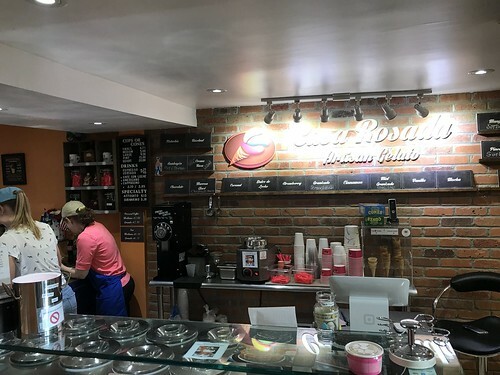 Casa Rosada tries to surprise you with some very interesting flavors including sweet corn, rice pudding, port and walnuts as well as my winter favorite - the best peppermint gelato. Their small cups are $4.99 including tax and well worth every penny. 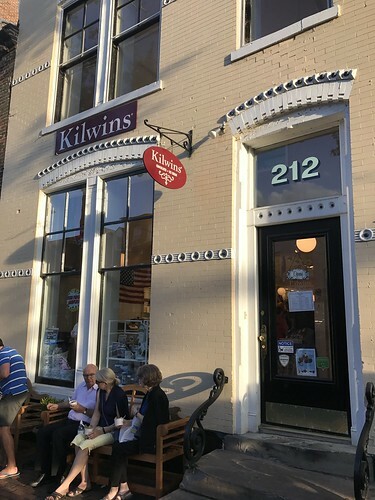 Kilwins, at 212 King Street, is one of the newcomer ice cream shops to open on King Street. It's ironic they're a recent addition, as they're nationally known as a favorite of many and recently celebrated their 70th anniversary. Their interior is a classic design of an old fashioned ice create and sweets parlor, and they're known to be generous with their portions. After ordering at the counter, you can grab your cone or sundae and sit in their outdoor seating area. Alex: Kilwins is a classic sweets factory from the moment you walk in the door, and they’re eager to satisfy your sweet tooth. 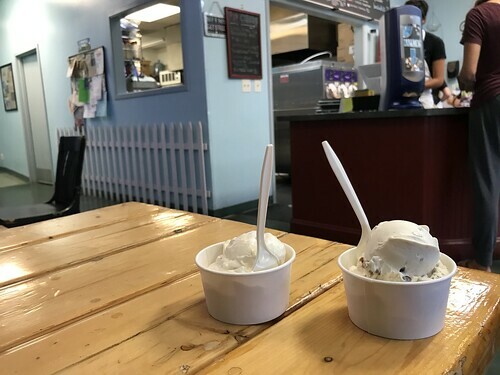 They quickly offer samples, have several cases of ice cream flavors, and love serving up heaping helpings with multiple flavors even in their “small” cups. I picked up half cake batter and half double peanut butter pie. Talk about my ideal flavor combo. The serving size is substantial, so splitting a small is completely reasonable. The ice cream is fresh and very good, and taking your cup or cone out on the bench on the sidewalk in front of the store is a great way to enjoy your ice cream (or fudge, or chocolates, or caramel apple, etc). 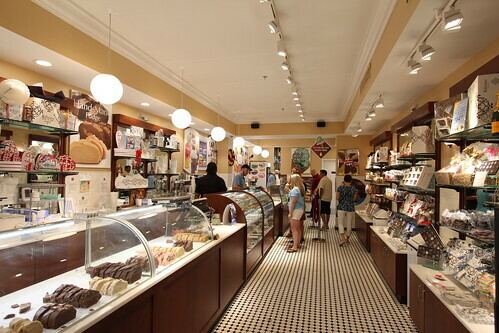 Dan: Walking into Kilwins is fantastic! Chocolates, fudge, candies and caramel covered apples. It is awesome but I was there for ice cream. A very nice selection however I found out that my favorite flavor, lemon meringue pie, was discontinued. How could that be? It was my go-to all last summer. Oh well, I guess it is time to try some new flavors. I went with a small scoop (which is really two large scoops). I tried the salted caramel (nice amount of caramel and I loved the salt flavor) and toasted coconut (tons of pieces of toasted coconut). Both flavors were very tasty; not sure if either will take over as the flavor of the summer, but would absolutely have them both in the future. 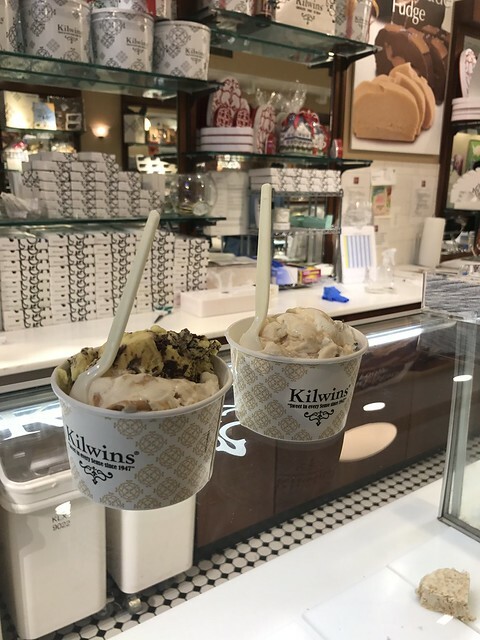 One thing to note, Kilwins has the most expensive small cup but it is also by far the largest amount of ice cream. 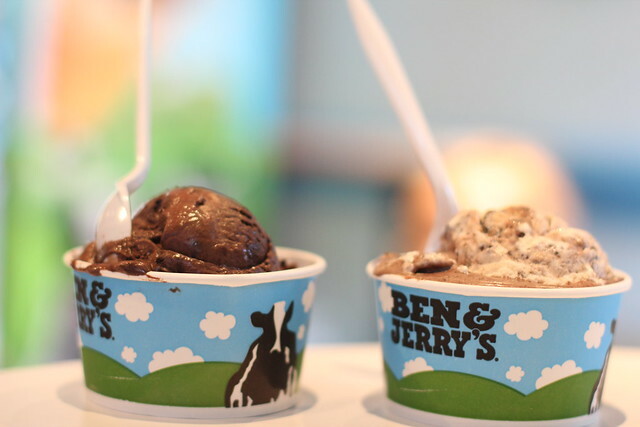 Easily two people could share a small scoop. Nicecream, at 726 King Street is the newest addition to Old Town's ice cream offerings, and is tucked in a small storefront between Eamonn's Dublin Chipper, and the Geranio Restaurant. 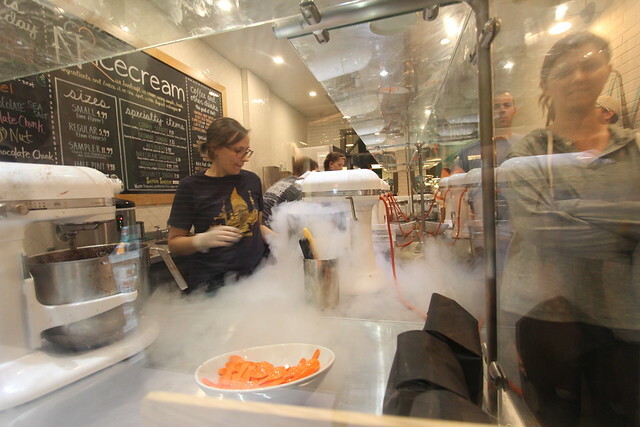 Nicecream's hand crafted approach to ice cream uses fresh local ingredients to create their custom flavor mixes, then freezes that mix in front of you using liquid nitrogen and electric mixers. A few quick turns of the mixing paddle and your ice cream emerges from the cold steam. Their flavors are eclectic and the presentation is certainly interesting (but that's part of the whole show). The interior of the store is nicely designed, and there are a few interior seats where you can sit and enjoy your scoops. Alex: A trip to Nicecream is certainly a show. 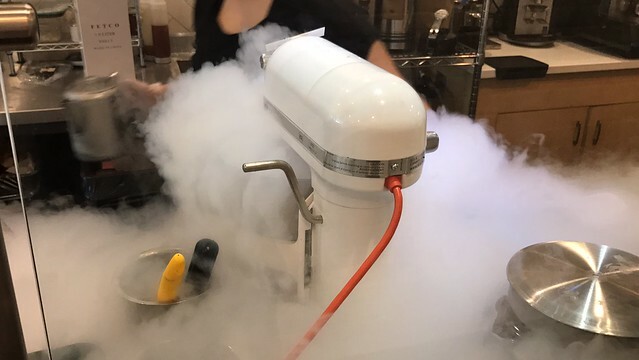 As clouds of liquid nitrogen steam spill from the mixers where your ice cream is being freshly prepared, it’s as much an experience as a way to get your ice cream fix. I tried their June flavor of the month, Strawberry Basil, and it was absolutely delicious. The basil was a refreshing and very nice addition to the creamy and very flavorful strawberry. As I understand it, the quick freeze of the liquid nitrogen allows Nicecream to leverage some fresher ingredients that wouldn’t work quite as well if the ice cream was made in a traditional manner. Though the shop is small, there’s plenty of seating inside, and the fresh approach to ice cream is a welcome addition to middle King Street. Dan: WOW FACTOR! We walked in and i saw liquid nitrogen steam in the air. Very cool and definitely adds some excitement to ordering ice cream. I started with a taste of Nutella ice cream and it was very good. I was in the mood for pistachio and Nicecream did NOT disappoint. The purely pistachio is ice cream with homemade pistachio butter and bits of pistachio and I really enjoyed it. Per the norm, I ordered a small but it has two decent sized scoops (it looked smaller that it actually was). The store is a bit small and on a busy day can be a tight squeeze while waiting in line but absolutely worth it. Nicecream is the newest ice cream shop on King Street but is quickly making a name for themselves! Dolce and Bean is far more than just gelato (though that’s the reason for our visit). They’re known as an artisanal confectionery shop and are located in the heart of Del Ray at 2300 Mt. Vernon Avenue. Though their beautiful cases full of chocolates, pastries, and their signature macarons greet you when you arrive, their case of homemade gelato beckons from the rear of the counter. Their Italian-style gelato favors milk over additional cream, leading to a smoother and more dense gelato that also happens to be a little healthier for you than traditional ice cream. 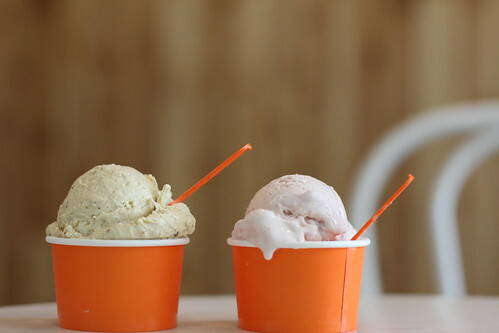 Their case consists of 12 flavors of gelato from traditional (such as strawberry or lemon) to more creative (such as peanut butter or vanilla bourbon). Alex: Though I had to force myself to stay on task rather than pick up a box of macarons, I sampled the vanilla bourbon but ultimately went with my favorite flavor of all time, peanut butter. The gelato was very dense and smooth, and the peanut butter smell and flavor was substantial. Had we been able to go with two flavors in a small I would have surely added strawberry (think PB&J ice cream). My favorite part of our visit to this shop was the staff’s friendly and interested interaction with us. They were talking with us about other ice cream offerings in Alexandria and even suggested specific flavors of other places we should certainly try. This tells me they really like what they’re doing and like to know their competition. Dan: Dolce and Bean is a brand new addition to the Alexandria ice cream scene and I was excited to check it out. Bright store, nice people working behind the counter, and the store had a good amount of sweets (macaroons, chocolates and baked goods). They all looked delicious but yet again I am here to eat ice cream. They offered ~10 different flavors of gelato. I started off with a taste of peanut butter gelato and it had a really nice peanut butter flavor. Since it was gelato I went with my standard; small pistachio. It was a vibrant green color. I would have loved some pieces of pistachio or some stronger flavor. It was a standard price ~$5 plus tax for a small. I really would have loved the ability to mix and match flavors (they offered the mix and match only with larger sizes). Old Town's lone remaining option for self serve pay by weight frozen yogurt is located at 100 N. Union, within the Torpedo Factory's walkway toward the waterfront. Whether you're in the mood for something tangy or sweet, you can grab a cup, dole out the amount you want, then add some toppings from the fruit, candy, and sweet sauces bar. Best of all, if you're in the mood for something a little lighter, frozen yogurt tends to be a healthier option than some of the other stores' offerings. 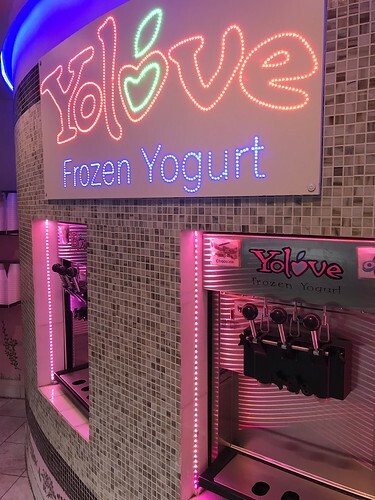 Alex: Sometimes I’m just in the mood for some frozen yogurt, and when that happens, YoLove is where we head. Wendy and I split a mixture of their tangy Oreo and chocolate flavor with a few Reeses peanut butter cups as topping. That’s the thing about YoLove, you can pick and choose what you like, and get as much as you do or don’t want. That’s also the problem, my eyes always seem to be bigger than my stomach at self serve locations, so I let Wendy work the portion control. Dan: Full disclosure. Frozen yogurt is not my first choice when eating ice cream, but my wife loves it. So I brought her along for taste testing (I did try it as well). She went with oreo and vanilla. 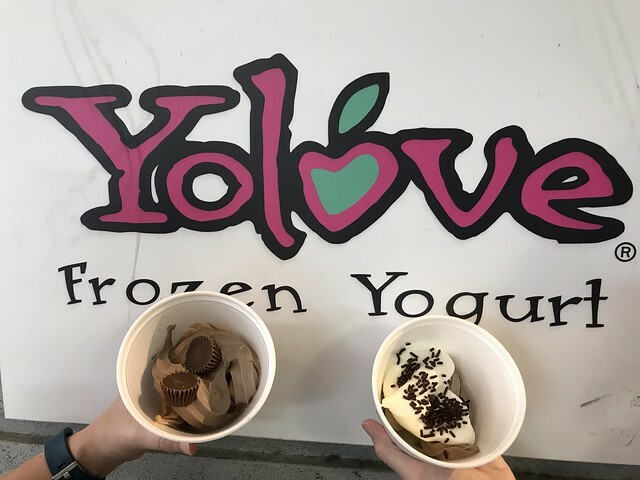 If you like a smooth tart frozen yogurt; then YoLove is the place for you They had six flavors and I love that you can mix and match all of them so that you can get exactly the combination you want. In addition they offer 20+ toppings. At $.55 an ounce, it was the most cost effective ice cream in Old Town. 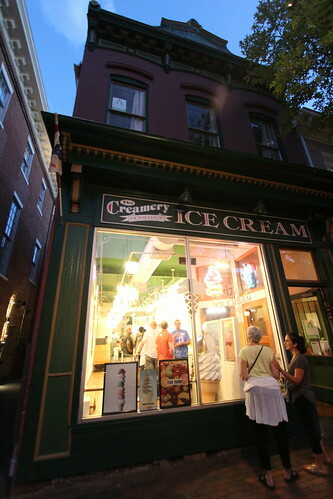 The Creamery at 110 King Street has a classic exterior ice cream parlor view. From the painted stenciled letters on the window, to the animatronic bears eating ice cream in the front window, this is your basic small town ice cream parlor. Their offerings range from real vanilla or chocolate custard, ice cream flavors by the scoop, or sundaes. There's a small seating section in the brightly lit interior, but more people grab their order and head outside to listen to nearby musicians on the sidewalk. Alex: Walking in we were immediately asked what we’d like to order. I ordered a small vanilla custard in a cake cone, which was $5 including tax. They're known for their custard so I figured that was a good way to assess their ice cream. Overall, it was tasty and true custard, not the type of soft serve you'd get at McDonald's. Beyond the ice cream, the interior of the store is fairly typical of what you'd expect from an ice cream shop in a touristy part of town. I'd likely recommend The Creamery to anyone looking for real custard that wants to stay in Old Town, or if they're looking for a quick option and the line across the street at Pop's is just too long. Dan: A nice hello from the ice cream clerk; I asked what is the best flavor today and she told me everything is wonderful. Ok, sure I believe her, so I went with homemade mango ice cream in a cup. It wasn't going to be my first choice but who doesn't love mangoes? It was sweet and creamy, and I would have really enjoyed some chunks of fresh mango. They offered 6% discount for cash ($5 for a small); I don't like carrying coins, so that was perfect. I will definitely go back to try the custard next time. The Old Town location of Ben & Jerry's is located at 111 S. Union Street and has been a staple in Old Town for over 20 years. 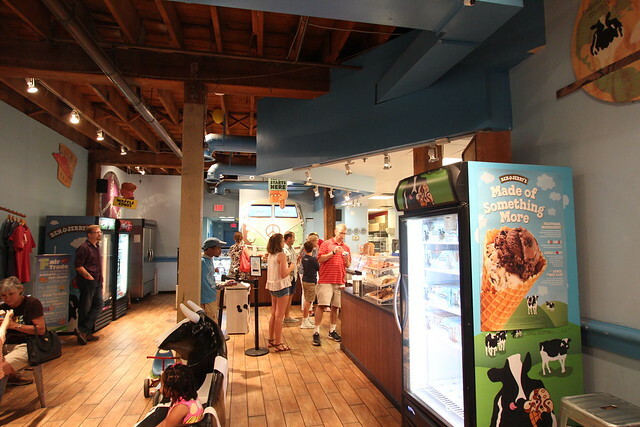 The shop is a standard Ben & Jerry's store nestled within an historic row house. There's not a lot of space inside to sit and enjoy your cone, but it's not cramped either. This is Ben & Jerry's, so you pretty much know what you're getting, but most summer evenings tend to have a lot of people visiting. However, no day is more busy than on annual Free Cone Day, where the line often snakes down Union Street and up King Street. Alex: We’ve been occasionally visiting this location for 17 years now, and it always seems to be well trafficked. I picked up a small in one of their newest celebrity flavors, Jimmy Fallon’s “The Tonight Dough.” I must say, as a fan of cookie dough, the flavor was pretty awesome. And there is something magical about grabbing an ice cream and walking around lower King Street that just can’t be beat. 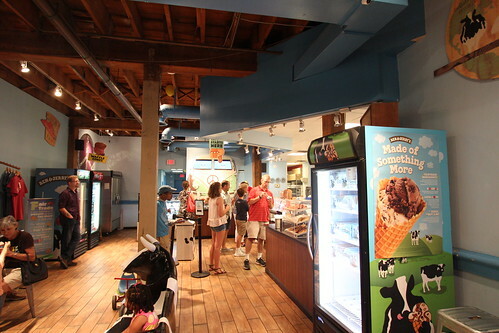 If you’re looking for something you know you like, Ben & Jerry’s might be the perfect place for you. Dan: It is Old Town, so when walking into Ben & Jerry’s you have to walk thru the bubbles. Nice touch and I love it! The Ben & Jerry’s smells like freshly made waffle cones and that smell is great. I went with my favorite flavor, Chocolate Therapy. Man, it is good and chocolatey! You really can’t go wrong with Ben & Jerry’s. It is familiar, taste good, nice variety of flavors and three people working so the line moves quickly. Espresso, Sorbetto, and Pie is what the people at 1012 King Street do! 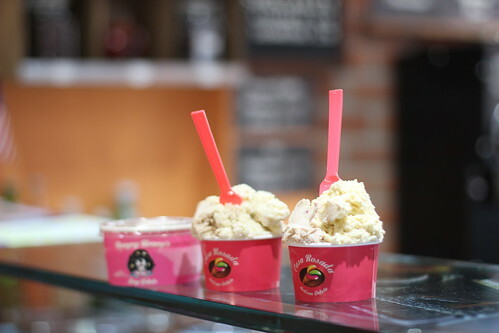 Initially opened as a Bocatto Gelato location in 2011, they have expanded their menu to reflect their name change. (Or did the new menu come first? It's a chicken and egg cream scenario if I've ever seen one.) 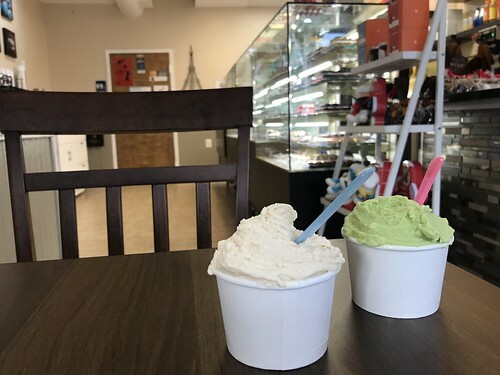 Today they offer fresh brewed coffee and sweet and savory pies from Dangerously Delicious Pies, but their sorbetto selections are still front and center when you walk in. Order up front, pay at the register, then optionally enjoy your sorbet in the indoor or outdoor seating they offer. The sad and out of order freezer. Alex: We tried to sample the ESP offerings on 4 separate occasions, but their freezer has been on the brink so no gelato of theirs was to be had. However, both Dan and I are familiar with their offerings. Their case is front and center when you walk in and their gelato always looks thick and inviting. We even delayed this blog post in hopes it could be fixed. Sadly, it's still broken. 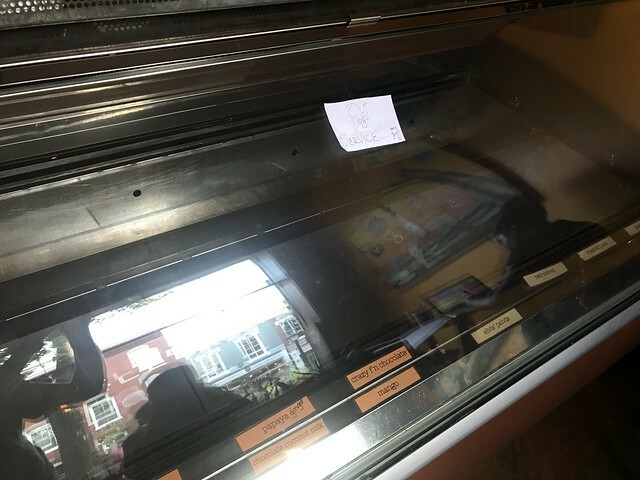 Dan: As Alex mentioned, we walked by four times and I called; the new gelato freezer will be up and running soon… unfortunately, we can not wait for ever and the ice cream review has to get out to the world. I really enjoy the overall concept of Killer ESP. It is a local favorite and normally a line to the door during all four seasons of the year. Custard Shack: I was blown away by the Sea Salt Caramel, love the price, puppy pops and no frills approach. They are a "cannot miss" for custard and worth the walk or quick drive down GW Parkway. Kilwins: A very nice selection of flavors and the small dish is more than enough for two people (and you can mix & match flavors). Yes, it is a chain with ~75 stores around the US but it feels like a small hometown Ice Cream shop. 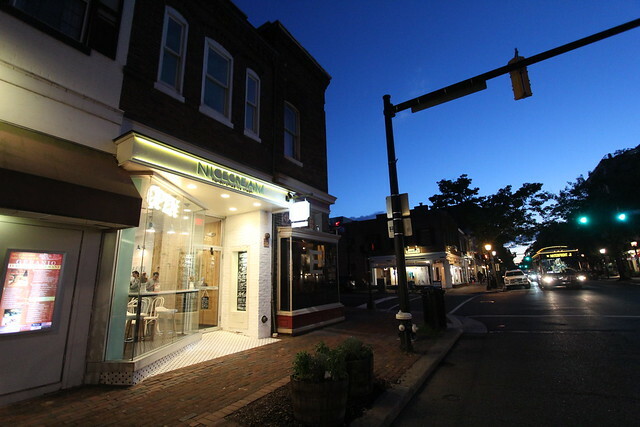 Nicecream: The newest ice cream shop to Old Town Alexandria and I absolutely loved the purely pistachio. So good! Getting your ice cream at Nicecream is an experience! Fantastic! 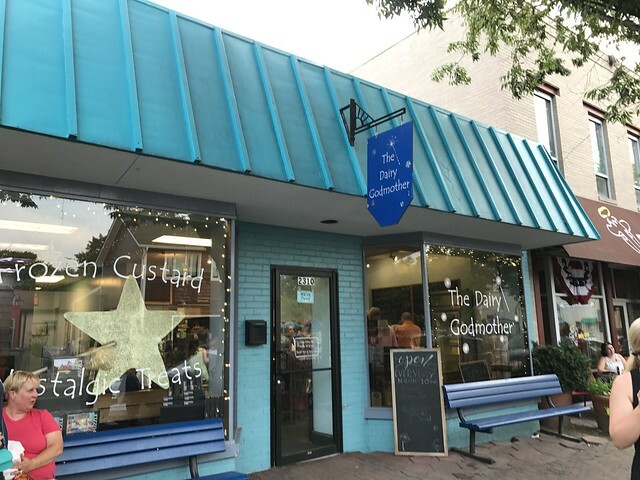 The Dairy Godmother: It is iconic within the Del Ray area of Alexandria and good reason because their custard is so delicious. I also recommend custard on top of their homemade baked pies - it is a summer delight! Also, Stella told me that they have the best puppy ice cream in town. Casa Rosada: I love gelato and Casa Rosada hits it on all marks. Standard flavors are fantastic, very nice portion that you can mix and match, price that hits the mark perfectly and they always offer some non-standard flavors that intrigue your tastebuds. Stella also gives Casa Rosada two paws up. Custard Shack: Though it's a little further away than some of the others, the custard here is excellent. A walk down the Mt. Vernon trail is a perfect excuse to stop by, and I love that it feels so much like the classic, no-frills ice cream stands I grew up begging my parents to take me to after little league. I really also like the fact the flavors are limited and different, which forces me to leave my comfort zone. The Dairy Godmother: Whether in Del Ray for dinner, Art on the Avenue, or just because we're out for a walk, The Dairy Godmother is always worth a stop when we're in the mood for custard. It's the quintessential local small business that we love to support and one of those places where you're sure to see many area locals. Their custard is very tasty and they certainly don't over complicate a good thing, and their prices are some of the best in all of the places we reviewed. 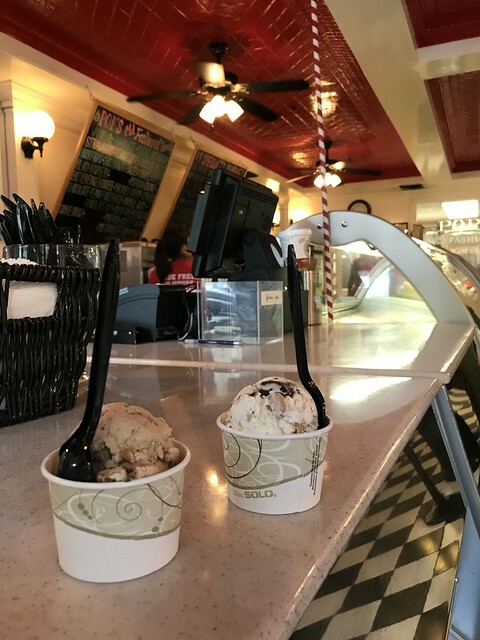 Pop's Old Fashioned Ice Cream: It's an Old Town institution and has some of my favorite local ice cream flavors. Though the line can be long, there's nothing quite like grabbing a cone or cup from Pop's and walking the waterfront pier while you enjoy it. The ambiance is great and the building it's in is so very cool. Dolci Gelati: I fell in love with gelato when I went to Italy right after college. No joke, I ate it three and sometimes four times a day when I was in Rome and Venice. Dolci is the place that really reminds me of those great cups of gelato I experienced years ago. Their flavors are delicious and the staff is so friendly that it makes going to the store a real delight. Even better, you can enjoy your gelato by the Market Square fountain located right across the street. Nicecream: What can I say, I like the show! It'll be even better around Halloween when it makes the ice cream look spooky. I also really like how creamy the resulting ice cream is and their flavor selections. I'm a big fan of the strawberry basil and can't wait to try the next flavor of the month. The decor is great, and it's also nice and close to our house (but most of them are). I think this will be one of our frequent stops when we're craving a cone. Though Lulu only has a few options for doggie ice cream, she can certainly weigh in on her favorites. Killer E.S.P. 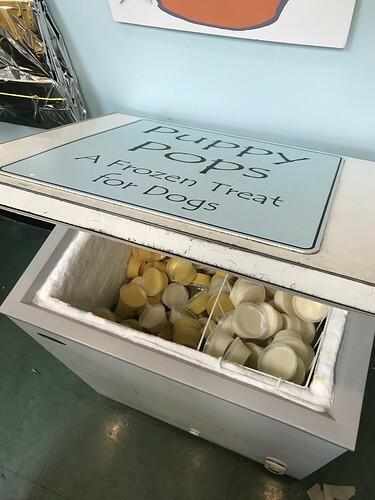 : Though their freezer was broken at the time of review, but their dog friendliness ranks tops among the shops. Lulu is always happy to stop by. 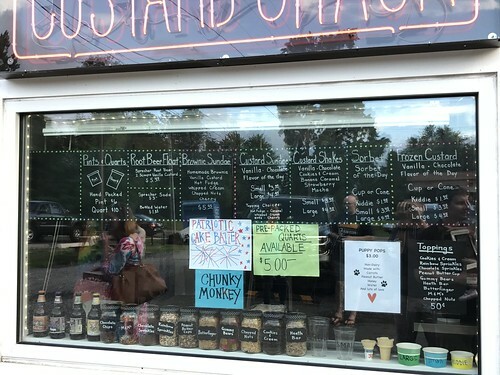 The Custard Shack: Yes, they have pup pops too! What dog wouldn't love a long walk on Mt. Vernon trail with a midway stop at the Custard Shack for a treat to cool down? Casa Rosada: Though she was a little unsure at first, she was sold after the first few licks. The benches out front are the perfect place to lick the bowl clean. The Dairy Godmother: A whole freezer dedicated to flavors that she enjoys any time of day, any day of the year is reason enough for this to be her #1. 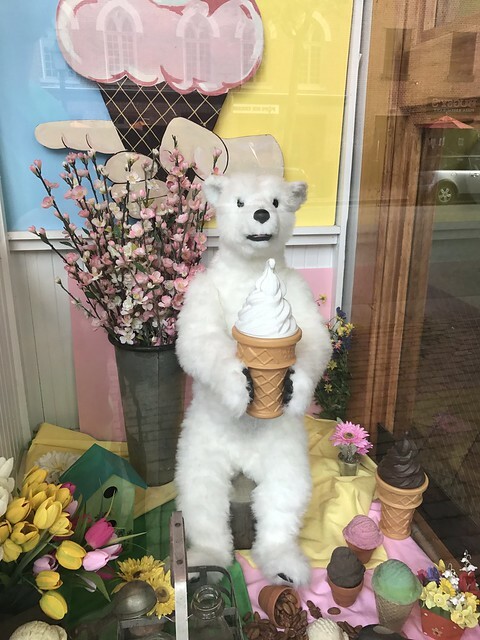 As you can see from this massive list, we are fortunate to enough to have quite the impressive selection of ice cream options when it comes to the immediate and nearby neighborhoods of Old Town Alexandria. Whether we're in the mood for classic ice cream, custard, gelato, yogurt, or even doggie treats, the decision we have to make isn't about whether or not to go out, it's more about where we should go. The fact that most of the shops are in beautiful old historic buildings only adds to the charm and enjoyment of the experience. So whether you're a local or just visiting, we hope this guide is helpful when it comes to planning how to best satisfy your sweet tooth. Great post! Like the two-person reviews, detail descriptions and interior photos. Will keep this one bookmarked for reference. Note that National Ice Cream Day is tomorrow, July 16th!! Casa Rosada has an ice cream sandwich that is out of this world...I don't know how the chocolate chip cookies don't get soggy, magic perhaps? But if you haven't had one it's worth a visit. They have an Oreo one too, but I always default to my favorite, chocolate chip cookie with vanilla gelato. Thank you for this post, I always end up going to either Pop's or the Creamery because they are closest to the water but will definitely be checking out some of the others on this list. A side note, I have been going to the Kilwin's in Fort Lauderdale, Florida my whole life (29 years) and was shocked to see it on my most recent trip to Old Town, can't wait to see how it compares. Love all the positive shout outs in each review AND the incentive to test our taste buds. Thanks for your valiant effort on behalf of the Alexandrians! These places all look so cool! I kinda wanna visit them all, lol. Thank you for sharing them!